The real Joe DiMaggio, remembered by one of the few who really knew the man behind the legend—candid and little-known stories about baseball icons from Ted Williams, Lou Gehrig, and his Yankees teammates on the field to Marilyn Monroe, Frank Sinatra, and others off the field. As told by Dr. Rock Positano, DiMaggio’s closest confidante in New York during the final years of his life, Dinner with DiMaggio is an intimate portrait of one of America’s most enduring heroes. This memoir of a decade-long friendship reveals the very private DiMaggio as he really was—sometimes demanding, sometimes big-hearted, always impeccable, loyal, and a true stand-up guy—while serving up illuminating stories and rare insights about the people in his life, including his teammates, Muhammad Ali, Sandy Koufax, Woody Allen, and more. In 1990, Dr. Rock Positano, the thirty-two-year-old foot and ankle specialist, was introduced to DiMaggio, the pair brought together by a career-ending heal spur injury. Though Dr. Positano was forty years younger, an unlikely friendship developed after the doctor successfully treated the baseball champ’s heel. At the start, Joe mentored Rock but came to rely on his young friend to show him a good time in New York, the town that made him a legend. 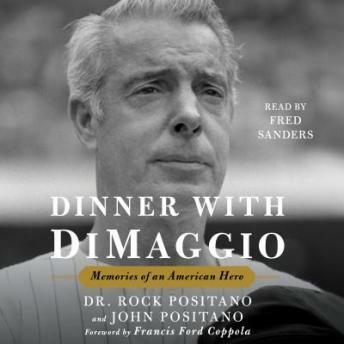 In time, the famously reserved DiMaggio opened up to Dr. Positano and talked about his joys, his disappointments, and his sorrows as he reflected on his extraordinary life. The stories and experiences shared with Dr. Positano comprise an intimate portrait of one of the great stars of baseball and icon of the twentieth century.